Here in Western Canada, it's easy to feel removed from the bassin' hotbeds of Florida, Texas, and California, or even the national bass mecca of Southern Ontario. For years, savvy western fishermen have watched techniques like flippin', drop-shotting, and swimbaiting develop thousands of miles away from their home waters, and have in turn taken some of these famous techniques and used them to win derbies and outfish their buddies on their home lakes. However, there is one popular eastern technique that has taken a long time to find popularity out west and the time has come for it to receive its just due. Although the Float 'N' Fly was developed by Smallmouth Bass fishermen in the Eastern U.S. it does more than wake up dormant Smallies. It can be downright deadly for everything from all species of trout and char, to whitefish, walleye and all sorts of panfish. But the reason this technique is so effective is that it catches fish year round, even in the coldest months of the year. Even frosty Largemouth will fall for the Float N Fly. The set-up is one familiar to float fishing Steelheaders, as it requires a slip-float to make it work. Cork floats work best as they cast better than foam and are sensitive to the slight bites which happen so often during coldwater fishing. You'll also need a bobber stop (which generally come with cork slip-floats, but can also be purchased seperately) and most importantly, a hair jig or "fly". The marabou "hair" versions are better for active fish due to their action, but when they're really docile, use duck flank feather jigs instead (see pic above) which have a more subtle movement. You'll want to attach all this to a 6 to 8 foot spinning rod with line weighted to the type of fish you're after. Starting with a 7 foot medium-action spinning rod, rig up 6 or 8 pound test and slide a bobber-stop onto the line. How far you slide it up is key, as you want your bait to sit right in the middle of where the fish are. Electronics can be a huge help, but if they're not available, the 10 to 12 foot range is a good place to start when keying in on schooling panfish. Be open to changing the depth until you start finding fish. Slide the slip-float onto your line then tie on your hair or feather jig of choice. I like to make my own in the traditional style of using an unpainted 1/16 or 1/8 oz jig head with flank feathers (the black/white striped variety) attached. Make sure the feathers are slicked back when the jig is in the water. The key to making this bait work is in its stillness. After casting out, allow it to sink and settle for 30 seconds or so, then pull it in slowly a few inches at a time. Warmwater fish like bass and crappie move around very little in cold water so they will be looking for an easy meal out in the open. When targeting these species fish near dropoffs that were good in the warmer months and fish deeper. 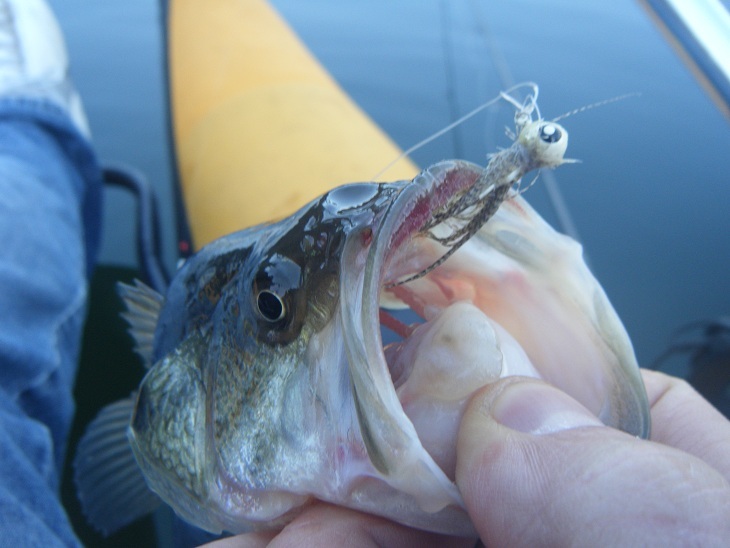 Bays with water over 5-6 feet can be deadly for holding coldwater panfish. Sunken trees and logs are other great fish-holding spots in colder months. Don't set the hook hard and wait for the float to sink well under the water before making a move. Waiting is definitely a virtue in fishing the Float N Fly, and the rewards can be great, as more than a few converts have had fantastic days while fairweather fishermen remain sitting at home. A chunky Perch falls for a Float N Fly in 0 degree water. Fat perch spawn right after ice-off and flies can do an absolute number on them. Stephen Headrick basically wrote the book on Float N Fly fishing, so check out his website at www.thesmallmouthguru.com for more info. Stay tuned next month for Part 2 where we take a look at modifying the Float N Fly technique for coldwater species such as Rainbow Trout and Whitefish. 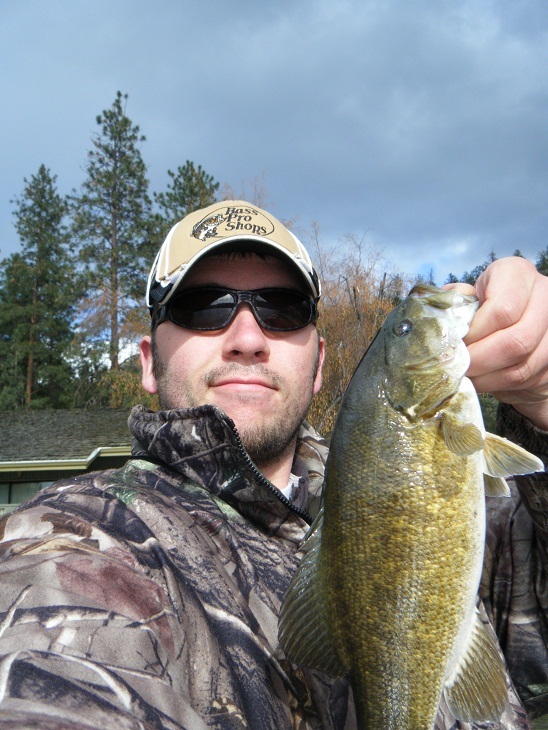 Practice with the F&F and you can pull nice Smallies like this all winter-long.